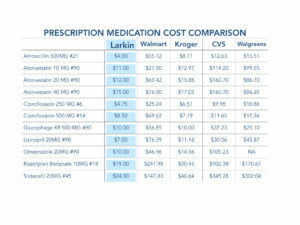 Prescription Medication for $4 a month? It’s True! We’re thrilled to be able to offer patients another affordable and convenient service: Prescription medications available for dispensing in our offices. We carry and are able to dispense several commonly prescribed medications, offering you tremendous cost-savings, not to mention the convenience of avoiding the line and wait time at the pharmacy. We offer the following medications at just above our costs – and way below the retail cost, and in many cases, below insurance co-pay costs. See the full table below for our current supply and prices (as of January 2018).